What Is The 2nd (Second) Commandment In The Bible? 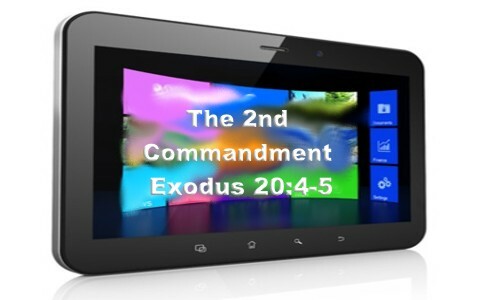 What is the Second Commandment all about? What does it have to do with our life today? When Moses came down from Mount Sinai, he came with the Ten Commandments. Sadly, the first time he came down with them, he crashed them down into the ground out of anger because the Israelites so quickly resorted to idolatry. Aaron caved into the pressure to make another god since Moses had been gone so long, so interestingly, the Second Commandment was broken even before they saw it! Such is our nature. We are all lawbreakers. The only difference for those who trust in Christ is that He kept the Law perfectly because we could not. He became sin for us so that the Father would see us as having Jesus’ righteousness (2 Cor 5:21), otherwise all lawbreakers will face the wrath of God (Rev 20:12-15; 21:8) because the wrath of God has not been satisfied. When Israel came out of Egypt, it was hoped that the idolatry would come out of them, but apparently not. When Moses received the Law from the very finger of God, figuratively speaking, I believe God placed in the order of importance and second in importance of the Ten Commandments is the Second Commandment which says “You shall not make for yourself a carved image, or any likeness of anything that is in heaven above, or that is in the earth beneath, or that is in the water under the earth. You shall not bow down to them or serve them, for I the Lord your God am a jealous God, visiting the iniquity of the fathers on the children to the third and the fourth generation of those who hate me, but showing steadfast love to thousands of those who love me and keep my commandments” (Ex 20:4-6). Next to not making any idols and placing them before God (Ex 20:2-3), God sees as supremely important that we not make any graven image and make that our own personal god. This “god” could be anything that dominates a person’s life or time. Our idol is whatever we value most in life. That’s the focus of the Second Commandment. When I heard a woman once say, “My god wouldn’t send someone to hell” and my answer to that is, “You’re right, he wouldn’t, because your god doesn’t exist.” Jesus is God and He spoke twice as often about hell as He did heaven. Jesus told the woman at the well that we must worship God in spirit and in truth (John 4:24). You can’t have one without the other. She had engraved a mental image of God in her mind but it was made according to her likeness and that’s idolatry, just as much (more?) as the golden calf that Israel worshiped (Ex 32). Those who believe that God is not intricately involved in His creation and that He has created it just to see what would happen are deists and they have the wrong god too. Many false religions or cults have their own God. Some make Jesus out to be less than divine. That’s breaking the Second Commandment. Others see Jesus as a created being and not being eternal, which is the same as making Him into an image of their imagination. The command to not carve any graven images is the most frequently broken command in the Old Testament but also today in our society. It might not be an icon or statue, but it’s still creating a god in their own image and after their own liking. If you went up to a person on the street and asked them to write out the amount of time that they spent in a week, minus their work hours, you might quickly find out what their own, personal idol was. But this might work with us too or those who’ve been born again. Our hearts gravitate to pleasure. Obedience to God does not always feel good, even though it does bring joy, so we can so easily drift into idolatry without even knowing it. I went over to see a friend a few weeks ago and he started playing a video game and asked me to join him. I don’t spend any time playing video games normally but I thought I’d be hospitable and so we played a little basketball on his video game. I admit, it was a lot of fun but then I realized I’d been there for over 3 hours. Wow! How’d that happen? That’s how sneaky our idols can be. They don’t make it obvious. It’s like the frog in the pot on a stove. The heat is turned up so slowly that the frog doesn’t notice it and in time, he’s cooked! Our own idols can do the same thing to us, using up our time and money. What does the Second Commandment have to do with our life today? A lot! Most people would not agree that they’re breaking the Second Commandment but I believe there’s nobody that’s ever lived in all of human history that hasn’t broken it. Jesus alone obeyed all God’s laws. This is not an easy fight; we are fighting our own human nature when we resist our idols. They can become so easily entrenched in our lives, and after they’ve been there for a time, they’re exceedingly hard to demolish. God knows what’s best for us and that is the purpose for the Second Commandment and all the commandments. We must be on our guard and not allow anything in our life to become more valuable than God, for He is infinitely valuable and beautiful and desires that we all come to saving faith in Jesus Christ. Previous post: What Does The Bible Say About Martyrs? Next post: What Happened To Mary, The Mother Of Jesus, After The Crucifixion?